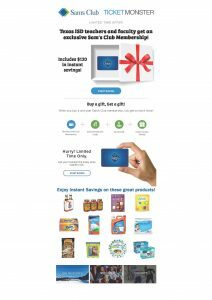 Limited Time Offer on Sam’s Club membership, extended this through the end of May. Teachers and faculty can receive an exclusive 1-year Sam’s Club Membership. Could come in handy for those renewing or looking to get their foot in the door with minimal cost!